The entire wine world was shocked to hear of the passing of Denis Malbec in a car accident a few days ago. Malbec was just 46 years old. Born into a winemaking family, Malbec spent his early years in France, most notably at Château Latour, before moving to California with his wife and partner, May-Britt. Denis Malbec was literally born at Château Latour, where his father and grandfather had held winemaker positions going back to the 1920s. Malbec took over the winemaking reigns in 1994, but the allure of California ultimately proved impossible to resist. In 2000, the Malbecs moved to Napa Valley, where they set up a consulting business along with their own brands, including Notre Vin and Aliénor. Malbec achieved his greatest successes with the wines he made for Claude and Katherine Blankiet and the Kapcsándy family. “Denis made my two favorite Merlot-based wines in the Napa Valley, which means two of the very best from anywhere off the Pomerol plateau,” Steve Tanzer told me. 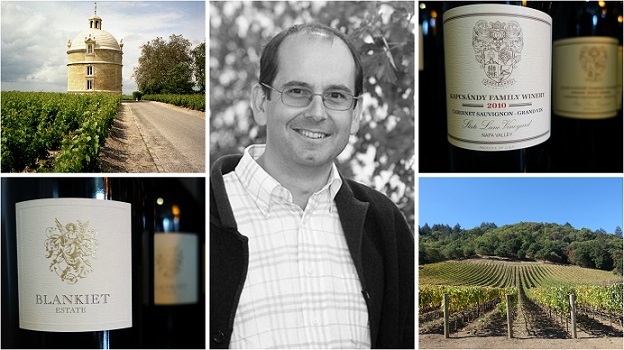 I first met Denis Malbec in 2011. I remember going to Blankiet in the middle of harvest. It was a typical October morning that year; cold, foggy and damp. The fruit was coming in fast and the sorting tables were humming with activity. As Napa Valley fans know, 2011 was an extremely challenging vintage. Botrytis was spreading across the valley floor with a pace few, if any, California winemakers had ever seen. Many producers were understandably stressed out when I visited them. But not Malbec. He had a cool “been there, done that” demeanor that governed all of his decisions. There was no stress and no tension, just concentration and a sense of purpose. I tasted with Denis Malbec 4-5 times a year. He was always immensely proud and enthusiastic about his work. I remember many barrel tastings at both Blankiet and Kapcsándy going through lot by lot, sometimes even cooper by cooper, as Malbec explained the subtleties and nuances about every choice. Napa Valley is an extremely competitive place that can, at times, bring out quite a bit of fire and ego. Denis Malbec had none of that. He was quiet, humble and unassuming, yet supremely confident about his work. It is those qualities I will remember most. All of us at Vinous would like to extend our deepest condolences to the Malbec family.